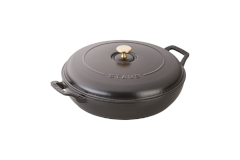 Staub cocottes are made of cast iron with a bright enamel coating. With a wide selection of bright colors they resist corrosion, chipping and cracking. The interior is great for even cooking without any hot spots. 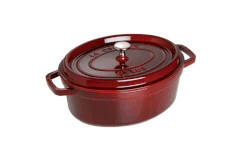 Raised areas on the lid helps divert moisture and flavor back into the dish.